The Dalai Lama, who reportedly said he became a vegetarian after seeing a chicken butchered, has appealed to U.S.-based Yum! Restaurants not to open a fast food KFC chicken outlet in his homeland, Tibet, according to an animal rights advocacy group. People for the Ethical Treatment of Animals, or PETA, released on Thursday a letter, purportedly from the Dalai Lama, telling the Louisville, Kentucky-based restaurant chain that his people believe in slaughtering animals humanely - and eat larger ones such as yaks so that fewer animals will die. Most Tibetans are not vegetarians. "It was the death of a chicken that finally strengthened my resolve to become vegetarian," said the Dalai Lama's purported letter to Yum! Restaurants' chief executive officer, David Novak. "In 1965, I was staying at a government guest house in south India," the letter said. "My room looked directly on to the kitchens opposite. One day I chanced to see the slaughter of a chicken, which made me decide to become a vegetarian." KFC currently operates in every Chinese province and region except Tibet. The company's representative in Beijing said in January it had plans to enter Tibet, but couldn't say when. The Dalai Lama - who won the Nobel Peace Prize in 1989 - is the senior spiritual leader for Tibetan Buddhists, who fled Tibet after a failed 1959 revolt against Chinese rule. He was followed by more than 120,000 Tibetan refugees, who settled with him in the northern Indian mountain town of Dharmsala, where Indian authorities have allowed him to set up a government-in-exile. China claims Tibet as its own territory, but many Tibetans say their homeland was an independent country before the Chinese occupied it in 1951. Vegetarianism may be just one objection Yum! 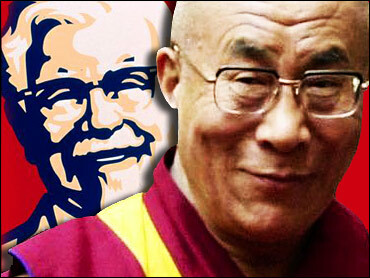 is up against in its plan to bring the bright lights and fast food of KFC to Tibet. Within Tibet, and outside of Tibet among advocates of the cause of Tibetan self-government, there has considerable alarm over changes in the region which the Tibetans view as an erosion of their traditional culture, the result of decisions made under Chinese rule.